Based on their combat achievements, friends and foes alike have singled out the men from the German 1st Parachute Division as the best soldiers in World War II, as they at Eben Emael executed the most successful commando raid of the war; on Crete the most audacious attack; and in Monte Cassino the most dogged defense. A total of 129 Knight's Crosses were awarded to men from this division - twice as many as any other German division. For the first time a comprehensive book has been written about the fate of this division based on all available sources and with the invaluable aide of veterans from the division. It is a warts-and-all tale, which gives a candid insight not only to the battles from the German perspective, but also to the minds of the men who became the backbone of the division. The books contains more than 500 color and black and white photos, many of which have never been printed before. Furthermore, there are thirty unique maps in color, thirty detailed Orders of Battle, 500 short biographies of the key personnel in the division, and a list of all the division's Knight's Cross and the German Cross in Gold winners. The first volume, Years of Attack, follows the recruitment and training of the Fallschirmjagers and their revolutionary vertical deployment in Scandinavia, Holland, Eben Emael, Corinth and Crete through to two tough tours as elite infantry on the Eastern Front. The second volume, Years of Retreat, follows the division from the battles of El Alamein, Tunisia, Sicily, Monte Cassino, Bologna, Normandy and Brittany to the final chaotic days before the capitulation. 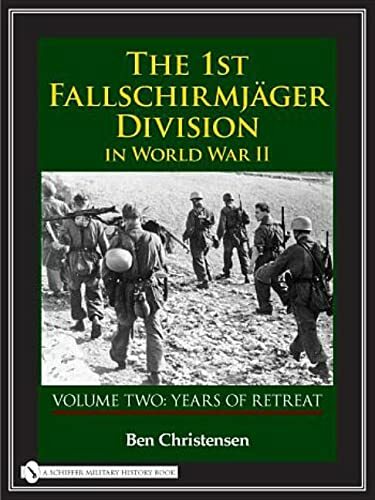 The battles are brought to life through nearly 1,000 eyewitness accounts and add new information to all the battles fought by elements of the German 1st Fallschirmjager Division. We are a Full-Time Book Shop in business over 16 years - We accept calls at 828-265-4970 and welcome visitors to browse our shop! We can special order books and ship gift books almost anywhnere in the world. We wrap most books with jackets in Brodart Dust Jacket Protectors at no extra charge - books sent from publishers will not be in Brodart Covers. We Specialize in Civil War, Military, and Genealogy Books and have the largest selection of Civil War and Military Books on the Internet. We offer discounts on new and reprint titles. Our Home Page shown with our Abe listings offers access to videos, maps, swords, autographs, music and other Military Items. Our shop and mailing address is: C. Clayton Thompson-Bookseller, 584 Briarwood, Boone, NC 28607. We do not offer any dealer discounts on ABE orders. NOTE: FEEL FREE TO INQUIRE ABOUT SHIPPING COST ON OVERSEAS ORDERS - WE CAN NO LONGER SHIP VIA SURFACE POST - WE ARE HAPPY TO QUOTE SHIPPING ON LARGE OR HEAVY BOOKS - SIMPLY CALL US AT 828-265-4970 OR EMAIL US AT "Greatbooks@aol.com"
Shipping costs are based on standard size books sent without insurance. Some books are shipped direct from publishers and added costs may apply as stated in book description - including shipments to Hawaii, Alaska and Overseas. Feel free to contact us to inquire on shipping cost. If your book order is heavy or oversized, we will contact you to let you know extra shipping is required.